Siemens Sinumerik CYCLE82 Drilling Counterboring cycle. Sinumerik CYCLE82 works on Sinumerik 840D, 810D, 808D and on similar Sinumerik CNC controls. The tool drills at the programmed spindle speed and feedrate to the entered final drilling depth (DP or DPR). A dwell time (DTB) can be allowed to elapse when the final drilling depth has been reached. 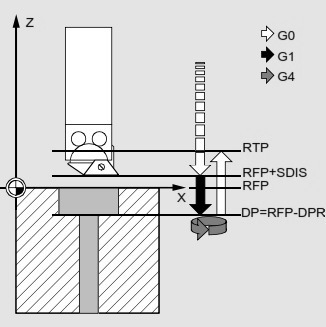 1: the drill will rapidly reach the start point (RFP + SDIS). 2: with given feed-rate will complete final drilling depth or hole depth (DP or DPR). 3: dwell for specified time (DTB) at bottom of hole. ContentsSinumerik CYCLE89 Bore 5ProgrammingParameters Sinumerik CYCLE89 Bore 5 In Sinumerik CYCLE89 “Bore 5” cycle, the inwards and the upwards movements are performed at the F value programmed before the cycle call….